David Koma aims to convey a sense of movement in his Spring '19 designs - this dress is decorated with reflective discs, so the mirrored patterns look as though they are constantly transforming. 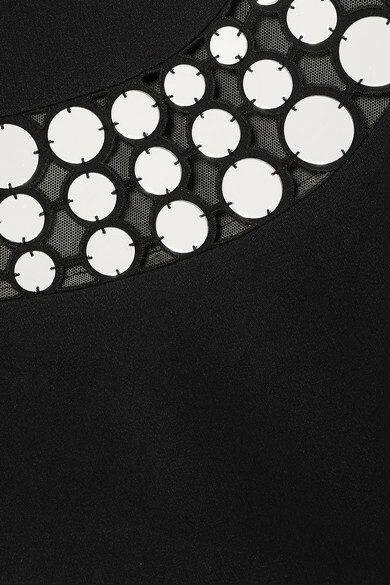 Made in the UK from black crepe and beige mesh, it has a slim, A-line shape and is spliced with swirling cutouts. Wear it with heeled sandals or pumps to complement the mini hem. Shown here with: CALVIN KLEIN 205W39NYC Shoulder bag, Saint Laurent Sandals.